I This recipe is adapted from a recipe of the same name in the original Silver Palate Cookbook by Julee Rosso and Sheila Lukins. When this cookbook was first published, I think I was served Chicken Marbella at three dinner parties in a row. Now 25 years later, this recipe is less used and is a great dish for entertaining. Although the original recipe calls for 4 whole chickens, quartered, I use 2-3 (depending on size) bone in or boneless (easier to eat) second joints, per person. To keep fat content down I buy skinless chicken or remove the skin and any extra fat. I have had this dish made with boneless chicken breasts but the breasts seemed over-cooked (breasts are much easier to over-cook in liquids than is dark meat). I use the cilantro option and serve warm with farfalle (bow-tie pasta) or more recently, my favorite: Trader Joe's Lemon Pepper Pappardelle Pasta. 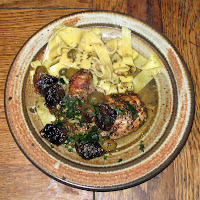 "This was the first main-course dish to be offered at The Silver Palate, and the distinctive colors and flavors of the prunes, olives and capers have kept it a favorite for years. It’s good hot or at room temperature. When prepared with small drumsticks and wings, it makes a delicious hors d’oeuvre. The overnight marination is essential to the moistness of the finished product: the chicken keeps and even improves over several days of refrigeration; it travels well and makes excellent picnic fare. Since Chicken Marbella is such a spectacular party dish; we give quantities to serve 10 to 12, but the recipe can successfully be divided to make a smaller amount if you wish." Pass remaining pan juices in a sauce boat.